On a class field trip we stopped at Rock Lake to have lunch. While there, we were talking about the steep basalt walls of the coulee that was formed by the Missoula floods. Dr. Chad Pritchard and I thought it might be cool to figure out what kind of basalt was at the loading docks at Rock Lake. So he gave me a hammer and I hit a rock about 10-20 times before a small piece of the rock broke off. I’ll be talking a little bit about how the Missoula Floods shaped Rock Lake and how Dr. Chad Pritchard and I figured out what kind of basalt it was. Rock Lake is considered a recessional cataract, which was in part created by kolks (or vortexes), which is caused by the intense turbulence of megafloods, decreased pressure, and decreased velocity. Kolks happened all throughout the Missoula Floods (Baker, et al. 1978; Allen et. al., 2009). To find out what kind of rock we had collected we needed to figure out what elements made up the rock. The first thing Dr. Chad Pritchard and I did to figure that out was cut a small piece off an exposed part of the rock. After that we had to smooth down the surface then we gave it time to dry. Once the rock had dried we needed to take an x-ray of the rock to figure out what the elements were in the rock because each element reflects the radiation at its own specific point. We used a Bruker Tracer III portable X-ray fluorescence gun to measure the Rock Lake sample. 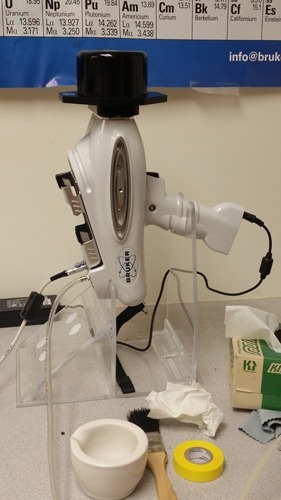 The x-ray fluorescence gun was connected to a computer that graphed the energy or KeV (Kilo Electron Volt) which varies depending on the element (Hooper, 2000). 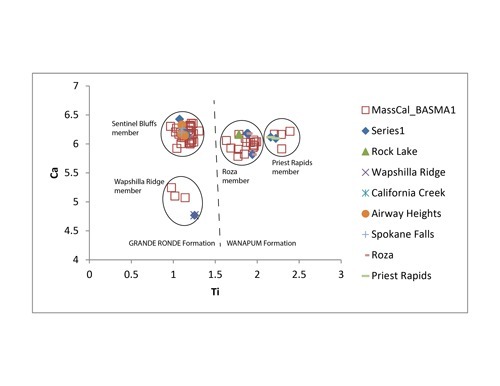 By doing this we found out that the rock sample is a Roza member of Wanapum Basalt formation, which means it’s about 14.98 Ma (Reidel et al., 2013). This was the same rock type that the Washington Department Natural Resources map had mapped for the southern parking lot. One way you can tell the rock was part of the Roza member was the amount of Thallium (Ti). The Roza member has more Ti then the Sentinel bluffs and the Wapshilla Ridge members and less Ti then the Priest Rapids member. The Missoula Floods that happened fifteen to twelve thousand years ago shaped Rock Lake and also unearthed the rocks that are there today. The lake has a length of seven miles (Allen et al., 2009). If the floods had never happened, the surrounding area wouldn’t be shaped as we know it today. Rock Lake wouldn’t even be here today without the floods because the kolks would not have picked up the fractured basalt that previously filled the current void. 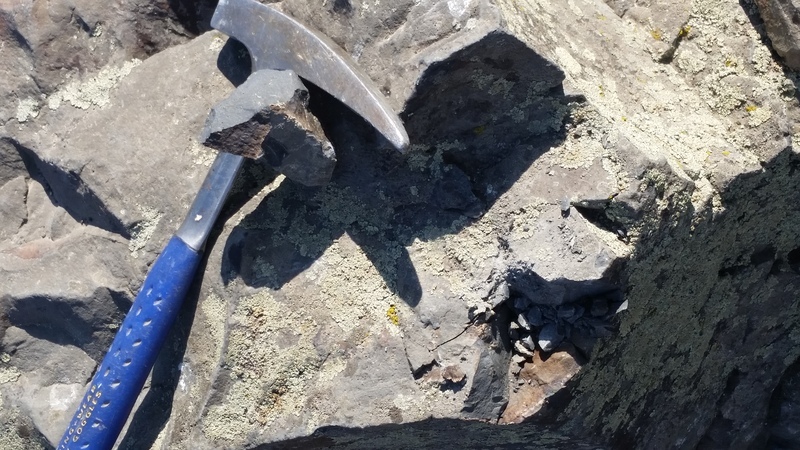 Because of the floods, I was able to collect my sample that would have been buried if the floods had not come through the Scablands, and I was able to figure out it is a Roza member of Wanapum Basalt formation. 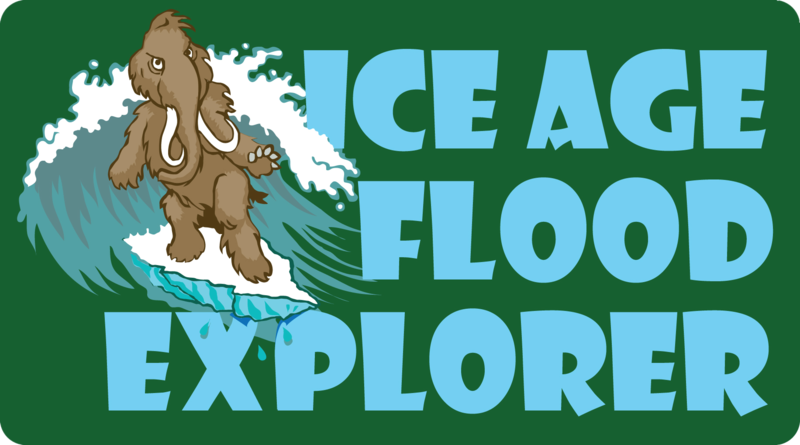 Jessica Blackwood , “Deciphering the Black Rock of Rock Lake,” Ice Age Floods Explorer, accessed April 21, 2019, http://floodexplorer.org/items/show/43. Reidel, S.P., Camp, V.E., Tolan, T.L., and Martin, B.S., 2013, The Columbia River flood basalt province: stratigraphy, areal extent, volume, and physical volcanology, in Reidel, S.P., Camp, V.E., Ross, M.E., Wolff, J.A., Martin, B.S., Tolan, T.L., and Wells, R.E., eds., the Columbia River Flood Basalt Province: Geological Society of America Special Paper 497, doi: 10.1130/2013.2497(04). 45 p. Hooper, P.R., 2000, Chemical discrimination of Columbia River basalt flows: Geochemistry, Geophysics, Geosystems, v 1, no.1, doi: 10.1029/2000GC000040. Allen, J.E., Burns, M., and Burns, S., 2009, Cataclysms on the Columbia: The Great Missoula Floods Revised Second Edition: Portland, Ooligan Press, 204 p. Baker, V.R., 1973, Paleohydrology and sedimentology of Lake Missoula flooding in eastern Washington: Geological Society of America Special Paper 114, 64 p.